Pat's Fantasy Hotlist: How do you define the sub-genre "Sword & Sorcery"? How do you define the sub-genre "Sword & Sorcery"? Another thing I missed last month was the SF Signal Mind Meld: What 'Sword and Sorcery' Means to Me. 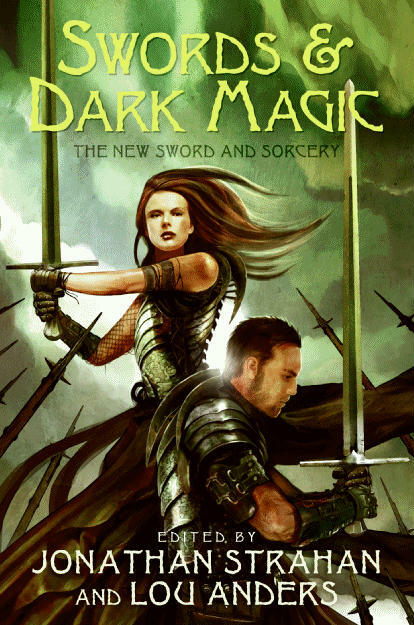 Lou Anders, Jonathan Strahan, and a number of contributors (among them Moorcock, Parker, Abercrombie, Cook, and Lynch) from the Swords & Dark Magic anthology (Canada, USA, Europe) answer the questions. First, I think it's important to remember that there's no right answer to this sort of question. The phrase I like to use is that all our in-genre labels are connotations without the benefit of denotations. They're trends and tendencies, not strict and formal boundaries. With that said, 'swords and sorcery' suggests to me a style of fantasy in which the protagonists tend to have a fairly high level of self-interest or even selfish interest. They may certainly find themselves saving the world, but there's nearly always some degree of greed or personal ambition also driving the story. Click on the aforementioned link to read the whole piece.